Addictions can infiltrate and influence so many aspects of relationships, and affairs and betrayal are no exceptions. Here to speak to her experiences as a Licensed Marriage and Family Therapist is Katie Leminux. Katie fell into working with couples in affair and betrayal recovery because she loved to see the huge potential for improvement. Time and again, she realized that addictions of all kinds play into affairs and why they happen or as a result of the trauma. We as therapists can provide the structure and framework for couples to work through intense, emotional struggles. Katie believes in the power of the Gottman Couple Counseling Model to help couples reclaim their relationship and recover fully from any addictions. 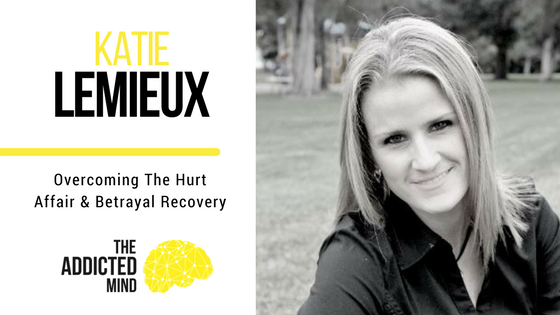 Today is your opportunity to see the hope that Katie sees, and to really understand how a complex recovery is really possible. How Katie “fell into” working with couples. The Gottman Couples Counseling Model. Changing the language of an affair to make it easier to talk about. The essential structures that help couples work through the difficult problems in an affair. Therapists have the power to help couples work through trauma as well as the unique types of hurt emotions that stem from betrayal. Learn the three phases of reclaiming a hurt relationship. The role of addiction in betrayal. Strategies that couples use to rebuild their relationship. 2-5 years, not 6-18 months. At 18 months many don’t even know if they want to stay in the marriage.